Property Size 3,073 sq. ft. 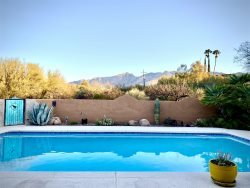 Welcome to Hacienda Fantastico, a lovingly remodeled mid-century modern house in one of Tucson's coolest neighborhoods. This warm and inviting home features a new gourmet kitchen with custom cabinets, polished concrete floors, a bright studio/rec room, and 5 generous bedrooms. The backyard retreat has a huge inviting pool with a cabana, changing room and outdoor shower. Soak up the sun ar cool off in the shade. Either way you will enjoy resort style living in your own private yard. This home is located in Catalina Vista, a neighborhood with wide streets great for taking walks, a small neighborhood park, and just blocks to the medical center, UA campus, cafes, and shops. The neighborhood is also home to the historic Arizona Inn, a great place to grab a bite of lunch or a cup of coffee. With over 3,000 Sq. Ft. of living space, a resort style backyard, a fantastic neighborhood and super convenient location, this home is a 'slam dunk' for your next vacation! Cleaning fee of $250 applies. Pets must be preapproved. There is a $150 non refundable pet fee.